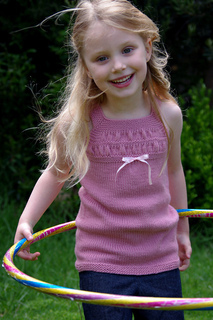 Acacia is a simple and summery little singlet knit seamless and top-down in cotton. 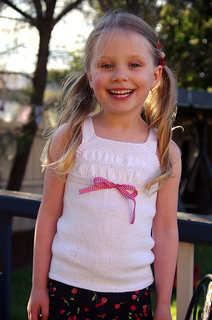 This is a deceptively simple and quick knit that yields gorgeous results. Acacia can be knit with either a few gathers across the bodice of the singlet and finished with a ribbon; or the body fully gathered. Either is equally cute and looks great teamed with either skirts, shorts or pants. 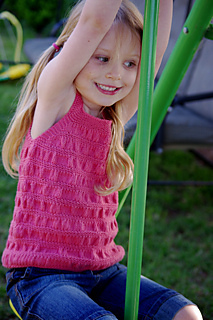 Worked in wool, Acacia is just as versatile as a sweet little vest for the changing weather. This is a seamless garment constructed from the top down. 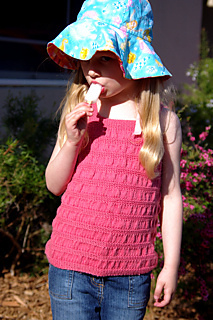 The shoulder straps and bodice is worked initially before casting off the shoulder straps. From there, the front and back of the bodice are worked separately before rejoining to knit the body of the singlet. 24-28: 24/61 (25/63.5, 26/66, 27/68.5, 28/71) inches/cms. 24-28: 23¼/59 (24/61, 24¾/63, 26¼/66.5, 27/68.5) inches/cms. Original yarn is a worsted spun multi-strand cotton. Yardage is approximate and may vary depending on your knitting style and yarn selection. If knitting in a wool or wool blend yarn, allow an extra 50 to 70 yards/45 to 65 metres for the fibre variance in yardage. Samples shown in Bendigo Woollen Mills Cotton in Snow and New Ochre. 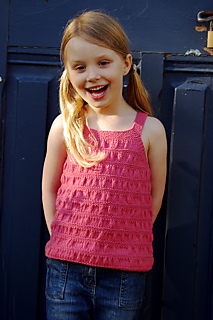 You can purchase each pattern individually, or the three as part of the e-book at a discounted rate. Join the tikki Ravelry group for any pattern support, yarn advice or just for the chatter and Knit-a-Longs.